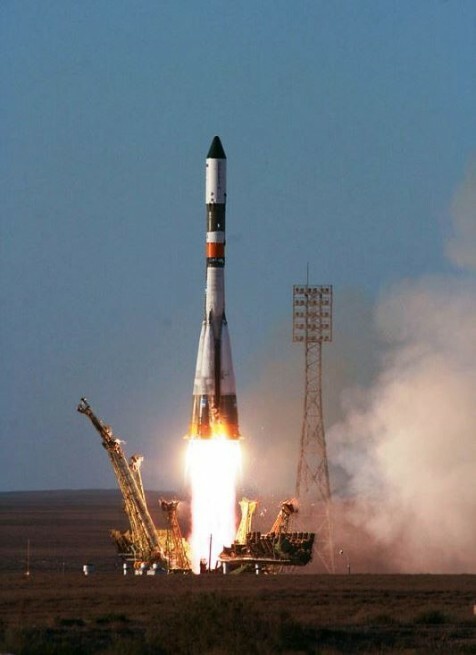 A Russian Soyuz 2-1a rocket, carrying for the first time the latest Federal Space Agency (Roscosmos) Progress M-27M cargo vessel, launched from the Baikonur Cosmodrome, Kazakhstan, on the second flight of the year for the venerable spacecraft. The mission got underway at the very opening of the launch window on Tuesday, April 28, at 3:09 a.m. EDT (1:09 ALMT, 07:09 GMT) with the Soyuz 2 launch vehicle lifting off into the early morning hours. The Soyuz 2 rocket cleared the pad and headed off into the blackness of space, its engines lighting up the surrounding steppes in a fiery orange glow, toward what was to have been a fast rendezvous with the International Space Station (ISS). 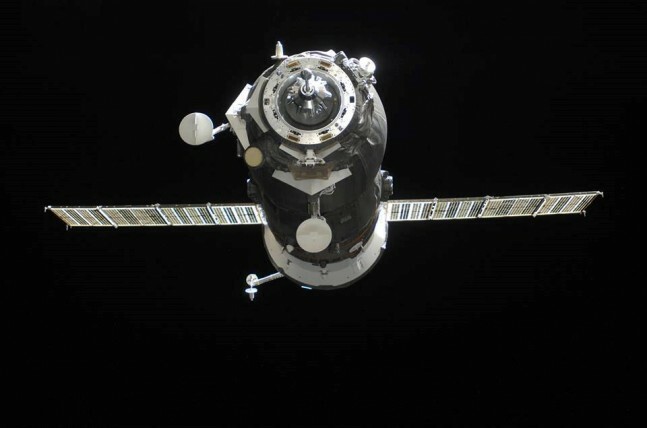 However, docking was delayed due to uncertainty regarding the deployment of the KURS antenna, which is used for the automated docking procedure. This is the second launch of the the Progress M-27M cargo vessel to the ISS; the first was launched by this rocket’s predecessor, the Soyuz-U. The 2-1 version of the venerable Soyuz rocket first flew in November 2004, having been developed from the earlier Soyuz-U and its predecessor, the Soyuz 11A511; the Soyuz 2-1 will eventually replace all the Soyuz and Molniya variants that are currently in service. Just after reaching orbit, it was apparent there was an issue. The Russian ground control team lost communication with the vehicle and noticed it was spinning in orbit. Docking with the space station, originally planned for today, has been delayed until 5:03 a.m. EDT on Thursday, April 30, granted all communication issues have been resolved and the spacecraft is healthy. So far, crews have not received any reliable data or communication from the vehicle since its solar arrays were deployed. This morning, according to the broadcast on NASA TV, Russian crews reported that the Progress spacecraft was spinning and it’s yet to be determined if the spacecraft can be stabilized even after communications with it have been restored. 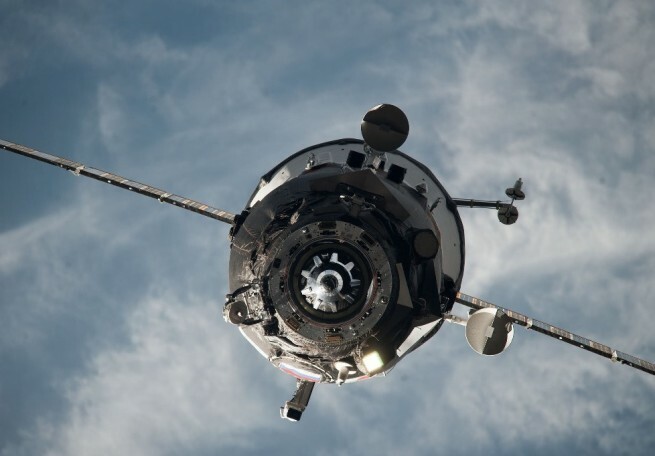 In order to communicate with the spacecraft, Russian crews must wait for the vehicle to fly over ground stations, they do not have dedicated networks to “talk” with the Soyuz or Progress vehicles. Teams are working diligently to reestablish communications and troubleshoot any issues. Currently, Progress is thought to be in a stable orbit, but commanding would need to take place in the next two orbital passes to ensure a docking on Thursday. Right now, crews in Houston have informed the astronauts on the station that there will be no docking today, and, for the moment, are not taking any steps in preparation for a docking on Thursday. The Progress vehicle is packed with over 6,000 lbs (2,722 kg) of equipment and supplies, including propellant, dry cargo, crew items, experiment hardware, and food supplies. None of the cargo is deemed to be essential or vital to space station operations. Currently, the station is resupplied by Russian, U.S., and Japanese cargo ships. In light of last year’s Orbital Sciences failure, NASA has been working to alter its resupply strategy. Currently, there is a four-month supply of food and other essential commodities on board to last at least four months, not including what the Russian and Japanese ships bring up. NASA’s goal is to have at least a six-month supply. Russian teams continue to troubleshoot and watch their data as the Progress flies over Russian ground stations. No telemetry is currently being received from the vehicle. Russia has released their ground control crews today, after four orbital passes without telemetry from the Progress vehicle. There will not be a docking today or on Thursday. Stay tuned as we will continue to update this story. Here is another reason why we (United States) should NOT be involved with Russia. We need to have another company/vehicle able and ready to ship supplies to the ISS. We also need to put Commercial Crew on the fast track and stop paying the Russians to be employed rather than our own people. As if America NEVER had any space incident or issues… Columbia, Challenger… You Jesse aren’t representing the ISS or international Community involved in the programm: ISS isn’t an American station! dot. Between, the 15th of january it was the american sector of the station that need to be evacuated not the russian one… be a bit fair when you launch some words Jesse, people could totaly go rampage your argument about using only america material. Jesse is absolutely correct in what he says. it’s people like you who have bought into the liberal notion that us Americans aren’t allowed to be proud. I agree with Jesse, we should have never gotten involved with the Russians. We (Americans) should be the leaders in space and there’s nothing wrong with thinking that way. And another thing, we should not be using our tax dollars to keep the Russians employed when we have the resources and people willing to do the job, it’s just this administration that thinks we need to sit on the side line. Guys, the ISS is an *International project*. It’s not a US only project, OK? Lots of countries have built and supply the space station one of which (just one, yes 🙂 ) is the US, and most have had issues at some time or other. And teamwork (remember that word?) has fixed all of them up to now. Because teamwork that gets things done! This is not about politics. Space should be above that – look where it’s got us on this planet. By all means be proud of what the US does but that’s not relevant here. Teamwork is, though.